In 2012, the average age of a farmer was 59, according to trending estimates from the U.S. Department of Agriculture’s Agriculture Census. The number of farmers age 65 and older grew by more than 22 percent between 2002 and 2007. The number of farmers younger than 45 dropped by 14 percent during that same period. REXBURG, Idaho – The agriculture industry is growing rapidly and, increasingly, young adults and teens are considering careers in agronomy, agribusiness and animal sciences. Enrollment in agricultural programs at both the University of Idaho and Brigham Young University-Idaho has nearly doubled in the past two decades. Yet, agronomy instructors said there still aren’t enough graduates to meet industry demands. “The ag market is booming, and there are jobs everywhere – there just isn’t anyone to fill them with,” BYU-Idaho agronomy professor Jared Williams said. However, the number of children returning to take over family farm operations is shrinking almost as fast as the greater agriculture industry is expanding. 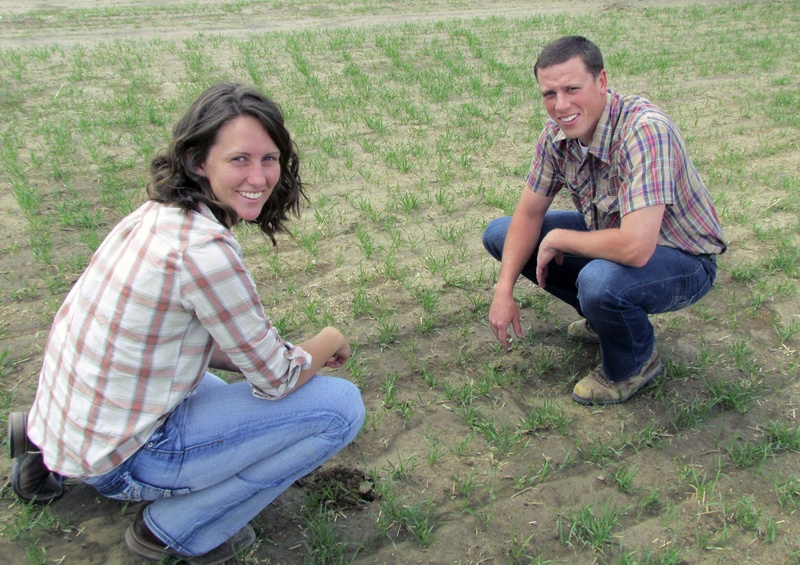 BYU-Idaho agronomy students Kyle Merrill and Rachel Taylor, both of Washington state, are bucking that trend. Both are excited about returning to their respective family farms. Each believes they can make a sufficient living despite the increasing difficulty of competing with corporate farms. Both recognize, however, that they are part of a minority. Merrill wonders whether he will be able to pass the farm down to his future children. In the past decade, the number of medium-size farms (producing sales less than $250,000 annually) has declined in the United States from 668,000 farms in 2000 to 577,000 farms in 2009. During the same period, the number of large commercial farms (exceeding $250,000 annually) has increased from 178,000 to 271,000. Additionally, farmers operating small to medium farms are getting older and fewer young people are stepping up to take their place. In 2002, about 50 percent of agriculture graduates at BYU-Idaho returned home to farm. Today, less than 25 percent of graduates return, Williams said. Paige Nelson, an animal science major at BYU-Idaho, is among those who won’t return to take over the family ranch in St. Anthony, even though she will inherit a large stake in it. Nelson is one of four siblings who will inherit the ranch, which is large enough to support only one sibling. So, rather than return home, the college senior is exploring other agriculture-related fields. She hopes to become an agricultural journalist. Like Nelson, other children raised on the farm are using their agronomy or agribusiness degrees to enter fields such as agricultural consulting, commodity sales or management jobs. But for Merrill and Taylor, the challenge of taking over the family farm and keeping it profitable in the face of growing corporate farms is very alluring.